A Happy New Year to all! Today, January 1 according to the Gregorian Calender, marks an interesting discrepancy between the Churches of following the Gregorian Calender and those following the Julian. For the Churches of Greece, Constantinople, Romania and the Levant, today is a dual feast, that of the Circumcision of Our Lord , and the Commemoration of one of the most important Fathers of the Church, Saint Basil the Great. So parishes in these jurisdictions often have a New Year’s Day liturgy celebrating these events and share Vasilopita (“Saint Basil’s Pie”) as a treat afterwards. In Georgia, January 1 according to the Julian calender is still a fortnight away. An Oekonomia (dispensation) is granted by the Patriarch for a relaxation of the Nativity fasting for some modest festivities on New Year’s Eve. On New Year’s Day, two eminent saints are commemorated, Saints Giorgi and Sava of Khakhuli, from what is now Turkey’s Erzurum region. 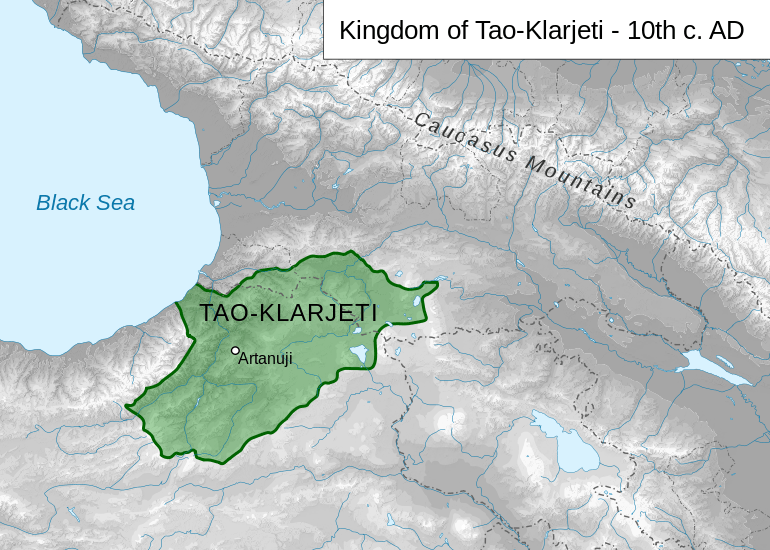 The history of the Georgian territories of Tao and Klarjeti has been intriguing me lately. These coastal and mountainous regions in northeastern Turkey were once the heartland of Georgian liturgical and artistic brilliance, to the extent that acolytes from as far as Kartli and Kakheti would travel there for instruction. David III Kuropalates, Prince of Tao, was a relative of the Bagrationi dynasty of Kartli. Inheriting the small territory of Southern Tao in 966, he developed a well-organised military force and fostered the Church in his domain, Following his assistance of Byzantine Emperor Basil in the Battle of Pankalia, he was granted the imperial title “Kuropalates” and granted extensive tracts of land in Eastern Anatolia, inhabited by Armenians, Greeks and Georgians. This consolidated territory from the Black Sea to Central Eastern Anatolia made him one of the powerful rulers in the Caucasus. David III continued the work of his predecessor Holy King Ashot the Great as a patron and protector of the Church, and established the Khakhuli Monastery, which was one of Georgia’s greatest centres of learning in the Middle Ages. The monastery now regrettably functions as a mosque. King David’s nephew and stepson Bagrat III Kuropalates eventually became the first Monarch of a United Georgia, incorporating all the regions of today’s Georgia as well as Tao-Klarjeti, Shavsheti, Meskheti, and Javakheti into what was to be known as Sakartvelo – “all-Georgia”. Hence, when the Patriarch is known as “Patriarch-Catholicos of All-Georgia”, it affirms his authority over the Church in all those regions, even when national sovereignty over those regions has been lost. Well known for his construction of the Bagrat Cathedral in Kutaisi, King Bagrat III continued his patronage of the great monasteries of Tao-Klarjeti including Khakhuli Monastery. He requested that Saint Giorgi of Khakhuli become his Spiritual Father, and became the patron of Saint Giorgi’s prodigious liturgical works, including essays and encyclicals that remain influential in Orthodox theology today. Saint Giorgi’s younger brother Saint Sava was remembered as a devout and upright person who laboured diligently as a monk at Khakhuli Monastery. King Bagrat III at one time seconded Saint Giorgi as spiritual advisor to his son-in-law Peris Jojikisdze, a minor nobleman of Trialeti. Unfortunately this noblemen fell foul of court intrigues in Constantinople and was executed by the Emperor, and his family and entire retinue were detained in Constantinople for twelve years. Saint Giorgi eventually returned to Khakhuli with his nephew, who went on to become Saint George of Mount Athos. Georgia’s “Golden Age” under Bagrat III is attributed in no small part to the spiritual guidance the Court received, and the flourishing of ecclesiastical literature, music and artwork during his reign was remarkable.